The Drumscreen Monsters are constructed of all stainless steel including components that others often neglect like chains and sprockets. The rotary screen materials are designed around both the influent as well as the requirement of the downstream wastewater treatment process. The wedgewire or perforated drums turn on UHMW trunnion wheels with sealed internal bearing for extra-long periods between required maintenance. The influent enters a headbox, where the energy is dissipated and the flow is evenly distributed onto the interior sidewalls of the rotary screen drum. Solids are retained on the screen surface while the liquid flows radially through the screen openings. Splash guards direct the liquid filtrate to a central drainage area as the solids are transported axially, by flights, to the open end of the rotary drum screen. 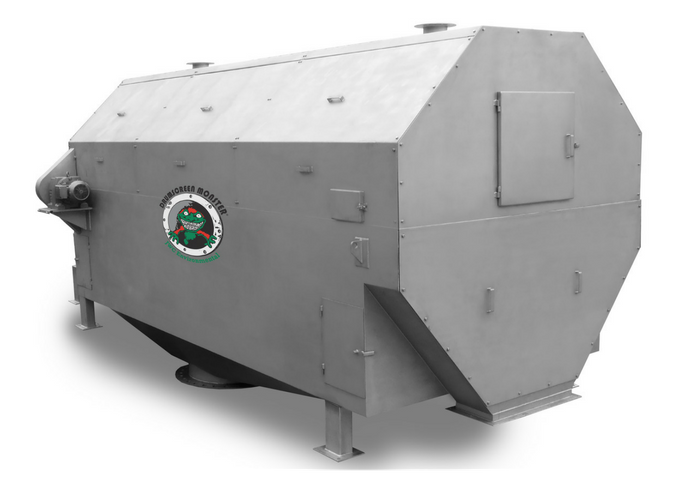 The rotation of the internally fed rotary drum screen allows the entire screening surface to be intermittently washed by a fixed, external spray bar fitted with a bank of spray nozzles.